I’m looking for a book about autism etiquette, but I can’t seem to find one. I felt there was a need for such a book, so I figured I’d write it myself. I’m a dummy! 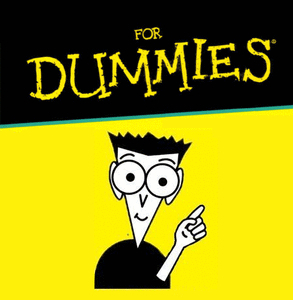 I can write a book for dummies! Then I realized, I really don’t know squat. As the father of an autistic child, I find myself facing autism etiquette questions every day, sometimes several times a day. And I usually get them wrong. Who am I to write a book about autism etiquette? The best I can do is this essay – even that’s iffy. It’s the way people act and react when they’re around people with autism. It’s also about the way parents react to their child’s autism, and how they present themselves and their child to the world. A parent can only control the way they react to their child’s behavior. And a parent’s reaction is often the best guide for how others will act toward your kid. Lead by example. That being said, sometimes my leadership is weak. When I’m out with my son I try to go with the flow, blend in, and not draw attention to his eccentric behavior. Maybe I should be more upfront with people. But when — and how — do you tell people your child has autism? I’m not talking about family and friends. I’m talking about strangers, people you meet as part of your daily routine. This is a more complex question than it seems, and, of course, the answer depends on the scenario. Autism is a strange disability on many levels, but primarily because it doesn’t look like anything. 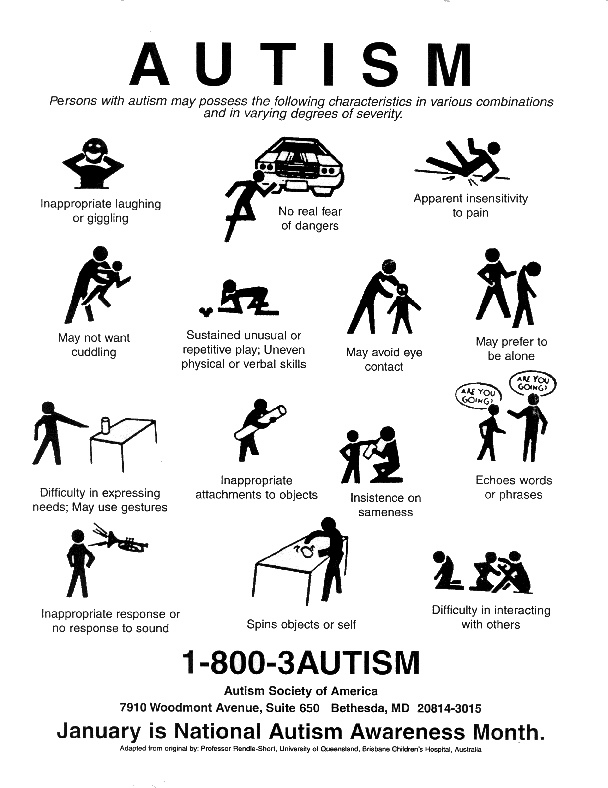 To the untrained eye, an autistic kid looks likes a regular child being a brat, throwing a tantrum, or acting weird. How do you handle someone who’s watching your kid act up in public? Rocco’s receptive language is pretty good, and I believe he does understand most of what I’m saying. Either way, I want people to treat him like he understands. Still, there are awkward moments. Once at the park, Rocco took the hand of an older girl, and led her to the see-saw. The girl looked a little bewildered, but kept smiling. Did I say the wrong thing? Should I not have said anything at all, and let her figure it out? They see-sawed for a few minutes. Roc broke it off first, and that was that. In hindsight, I probably didn’t have to say anything at all. He could have just been a quiet kid playing with another kid. My wife handles things differently than I. She addresses our son’s autism right away, and politely relates it to the situation at hand. My wife’s approach is to the point, and gets the issue of my son’s autism out of the way. But I’m not convinced it’s entirely correct. I’ve read several anecdotes from autistic adults who felt their moms did them a disservice by always associating their autism with negative things (“he’s autistic, so he can’t speak, he doesn’t like bright lights,” etc.). They would have preferred their mothers occasionally refer to their “autistic brain power.” I’ll have to try that one sometime. I feel my son’s autism is on a “need to know” basis. If I feel it will help resolve a complicated social situation, I’ll tell people he has autism. But sometimes you don’t feel like explaining everything to a layperson. And you definitely don’t feel like explaining it to some pinhead you pass in the supermarket, giving you the hairy eyeball because your kid is screeching like a banshee, or grabbing cans off the shelves. Some parents solve this problem by putting their kids in “autism awareness” T-shirts. There are plenty of cute ones: “I’m not a brat, I’m autistic,” and “Think you’re having a bad day? Try having autism!” among them. But the flipside to the autism T-shirt solution is that it can make autistic kids look like they’re wearing a scarlet letter. After all, you don’t see people walking around with T-shirts that read, “I Have Dementia”, or “Hug Me, I’m Bi-Polar.” Why should kids with autism have to, literally, wear their disorder on their sleeve? What was the most important thing I learned while researching my autism etiquette book? That there’s no need for one…at least there shouldn’t be. Treat an autistic person with the same attention, respect, and dignity you’d show a neurologically-typical person. You might not get the response you expect. You might not get any response at all. But do it anyway. And keep trying. Be patient and persistent, and you and your new autistic friend will both feel better. Autistic children (and adults) want the acceptance of their peers, just like anyone else. Lots of autistic people have trouble making eye contact, but that doesn’t mean you should. Look kids with autism in the eye, and greet them with a warm, welcoming smile. Even though a child with autism may seem like he’s ignoring you, he’s probably not. Either way, don’t do the same to him. Talk to autistic kids at an age-appropriate level. Don’t talk down to them. Just because a child with autism may have the vocabulary of a two-year-old, doesn’t mean he has the mind of one. Kids with autism can be very sensitive to moods and behaviors. If you’re tense and nervous they’ll pick up on that, and they’ll be tense and nervous too. Relax and take the pressure off. Everyone will feel more at ease. You’re the adult, and kids — both autistic and typical — look to you for social cues. So do their parents. Set a good example. The world will be a better place for it.